Defender Colm McLaughlin has joined Institute. After signing Joe McCready a number of weeks ago, Institute have added duo Colm McLaughlin and Ronan Doherty. Boss Paddy McLaughlin admits while he’s delighted with his new additions, he still believes that he needs to strengthen his squad. 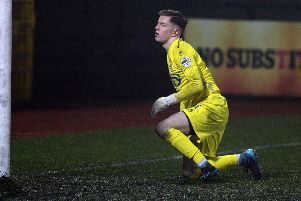 Left-back McLaughlin was playing for Ballinamallard United last season, while Doherty, who played with the Waterside men a number of years ago, comes into the squad full of confidence as he helped Cockhill Celtic claim an USL (Ulster Senior League) league and cup double. “It’s great that we have another quality left-back this season in Colm,” stated the ’Stute gaffer. “Colm has quite a few years’ experience of Premiership under his belt and that will help us. While young Ronan is a very talented player, who plays in the left wing but can play in a number of positions. McLaughlin confirmed that the Waterside men start pre-season training on June 23 and they play their first friendly at Ballinamallard on Saturday July 14th before facing Portstewart (Away) - July 21st; Dergview (Away) - July 24th and Derry City - July 28th.